New York's food scene, I think, can be neatly divided into three major categories: the dives, the "of-the-moment" locales, and the institutions. While I'm a sucker for a good hole in the wall, and I can pretty easily be convinced to follow all things shiny ("Oh! A foil wrapper! A shiny, albeit overpriced, accessory! A restaurant with impressive, trendy decor! "), my real favorites in New York and beyond are the institutions. These are the venues that simply swell with history, the places where the staff has served the same tables and prepared the same dishes not just for years, but for generations. They are the types of establishments that refuse to change with the times, where a substitution request will get you kicked to the curb, and where the family who originally signed the lease still has their name on the door. Lucky for me, New York is ripe with these institutions. And even better, recently, I had the opportunity to visit yet another of them. A few weekends back, while driving over to the shop to load up for the Brooklyn Night Bazaar, the chef and I realized we were (for once) a bit ahead of schedule. We decided to make a quick pit stop to grab food for the road, considering our only nourishment for the day came in a pile of empty coffee cups on the floor of our car. Since in the days leading up, I'd been complaining about a recent brunch I'd attended that consisted of ill textured lox, the chef suggested we head someplace to remedy my breakfast misfortunes. My plan was for the chef to circle the block and for me to jump out and grab some food. The chef's plan was to offer me a list of tips and directions for when I arrived inside the shop. "Seriously," I responded, somewhat taken aback. "I've flown to foreign countries by myself. I'm pretty sure I can handle ordering a few bagels." Oh. My. God. Despite the fact that the shop closed in less than a half hour, a true mass of people flooded the narrow entryway. The vast history of the place, which has been in operation for over a hundred years, was evident from the moment I stepped beneath the facade's glowing neon sign and onto the small white vintage tiles that lined the floor. Behind a long glass deli counter stood a line of employees who wore crisp white lab coats with the sort of confidence that suggested their ensembles were meant more for function then for the sort of nostalgic irony you find in some newer establishments. Behind them, a series of shelves were neatly stacked with a metallic rainbow of small tins filled with caviares and cured fish. And though it pains me to admit it, this time around, the 'ol husband was indeed right. I did need directions, as I found myself completely (and happily) overwhelmed -- enamored, really -- from the moment I grabbed my paper number and joined the mass that was meant to resemble some form of a line. When my number was called, I was too busy staring through the glass case as the staff artfully hand sliced the smoked fish with a slender knife, gently folding each nearly transparent piece onto a delicate smear of cream cheese. Luckily, an anxious customer nudged my shoulder. "You'd better get up there," he said, eyeing his own number, which was the next to be called. In a bit of a daze, I approached the counter, repeating the chef's words by way of instinct, and then continued to watch as paper thin slices of salmon were artfully arranged atop a smooth layer of cream cheese, a sprinkling of capers, and a perfectly palm-sized bagel that dutifully served the purpose of allowing all the smoked goodness piled on top of it to really shine. It's tempting, I think, in a city as big as New York, to become easily influenced by those around you. Whether in business or in life, there is always someone around the corner who is doing something better, something more innovative, and something more impressive. However, when it comes to preparing great food, some things simply cannot be duplicated, nor can they be taught. They must be learned, usually over a great length of time. That is the path to perfecting the sort of sophistication that arrives with true simplicity, and truly memorable food -- the sort of food, that is, that can stand up to a few generations worth of opinions. This was the first of two major lessons I learned on my recent trip: the art of doing something simple and learning how to do it really, really well. While Russ & Daughters is void of the sort of shock value and contemporary glamour that is typical of some more contemporary food establishments, this void is masterfully filled by a handful of individuals who take their jobs and their craft incredibly seriously. As I walked around the block and back to our car, my bag of bagel sandwiches dangling from my wrist, I couldn't help but to feel incredibly inspired having witnessed such dedication and such passion. It really does make all the difference. 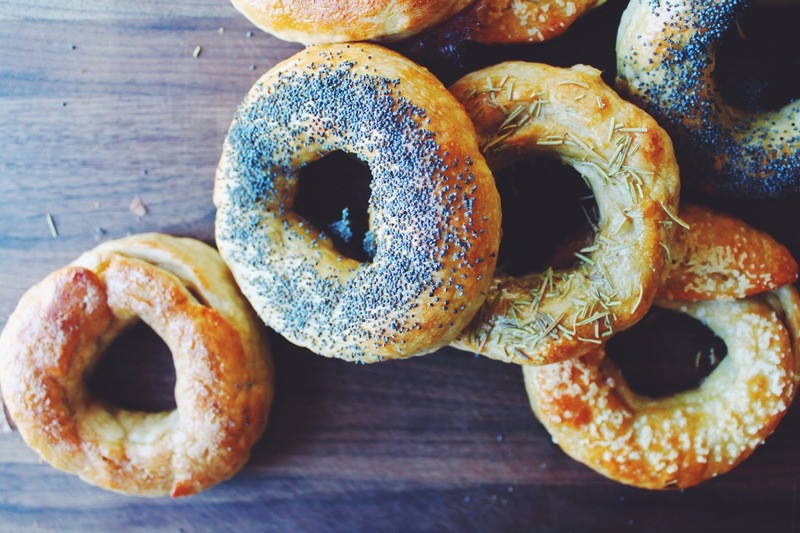 The second lesson I learned was that I've been doing bagels all wrong. For years, I've turned my nose up at puny bagels, certain that they would never fill the great void that is my appetite. However, I now consider myself a convert to a smaller class. It turns out that making homemade bagels is impossibly easy and, well, fairly difficult to screw up. The dough, which is kissed with just a bit of honey, will need one evening to rise, though the in-between steps are perfectly simple (mix ingredients, knead for a few minutes, form bagels, and that's about it). Though you can certainly twist up bagels that are any size you like, I was happy with mine, which (pre-baking) were about the size of my palm. Plus, unlike most larger bagels that, when piled high with cream cheese, leave me feeling fairly meh the rest of the day, these proved to be the perfect vehicle for assembling sandwiches that didn't force me to clock out for the remainder of the afternoon. 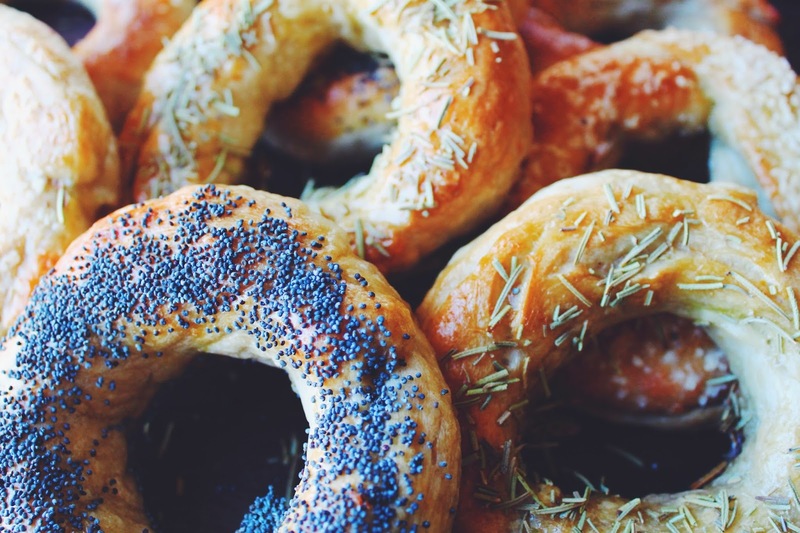 After poaching the bagels in a simmering bath, you can decorate them by sprinkling on nearly any topping you can dream up (though going topping-free still makes for a pretty legitimate bagel as well). When you remove the baked bagels from the oven, you'll find a golden exterior that is firm enough to inform you that, yes, this is a bagel that you're eating for crying out loud and not a loaf of bread, but an interior that is chewy enough for you to easily bite right through. 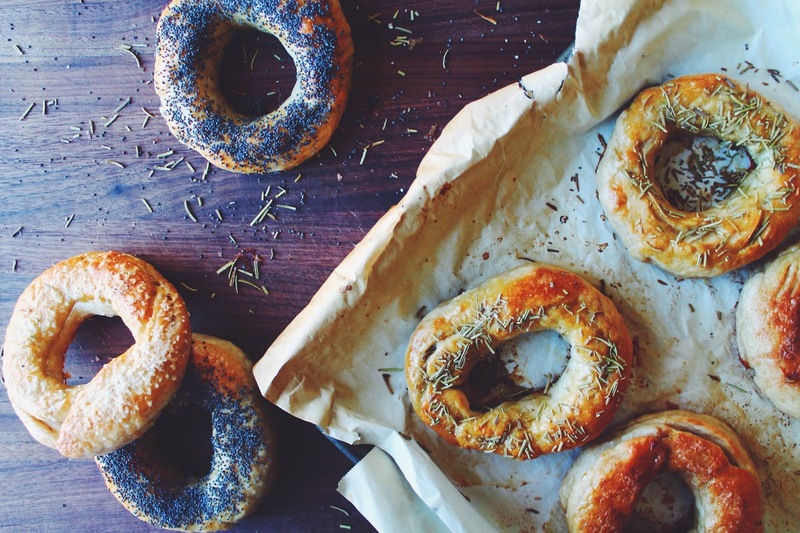 While many recipes in our house tend to come and go, it became pretty evident pretty quickly that these bagels will be an institution of sorts in our home kitchen, a recipe that, despite the new cookbooks, the new influences and the new trends, will likely be sticking around for at least a handful of years. Pretty much anything goes here. This time around I used salt, dried & crushed rosemary, cinnamon sugar and poppy seeds. Rather than measure out the topping ingredients, I recommend just sprinkling them on until you feel satisfied. Mix the flour, 2 teaspoons of the salt, the yeast, the honey and the water in a large bowl until the mixture forms into a sticky dough (it is best to do this by hand). Allow the dough to rest, uncovered, for about 8-10 minutes. On a lightly floured surface, knead the dough for about 5-6 minutes and then shape into a ball. Place the dough into a well-oiled bowl. Cover the bowl with plastic wrap and place the bowl in a cool oven for about 1 hour. Meanwhile, line a baking sheet with parchment paper. Lightly grease the parchment paper and set aside. Remove the dough from the oven. Cut the dough into 8 pieces. Roll each piece into a ball, and then roll each ball into an 8-10-inch log. Form each dough log into a circular shape. Be sure to tightly squeeze the dough ends together (they should overlap by about an inch). 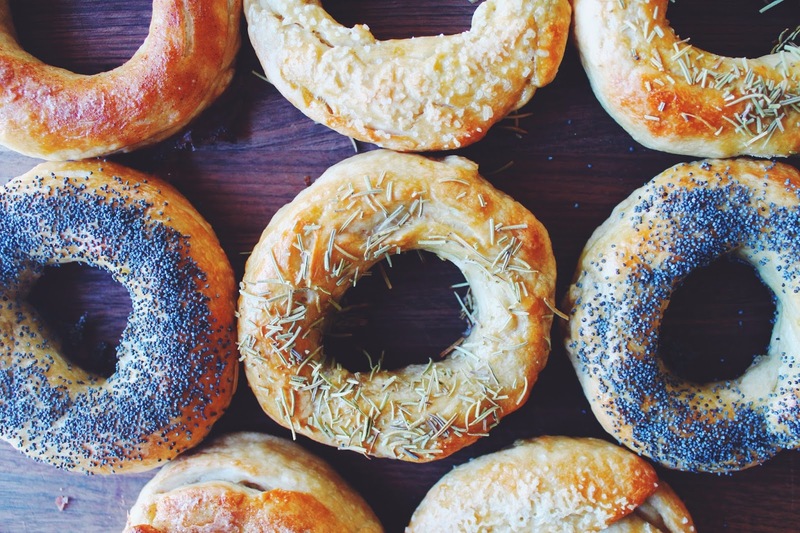 Repeat for all of the bagels. Lightly oil the bagels on all sides, place them on the greased parchment paper, and tightly cover the baking sheet with plastic wrap. Store the baking sheet in the fridge overnight, or for at least 8 hours. The next day, remove the baking sheet from the fridge. Preheat the oven to 500 degrees. Fill a large pot about halfway with water. Bring the water to a boil. When the water boils, add the remaining 1 teaspoon of salt and the baking soda to the water. Lower the heat to a simmer. Drop the bagels, a few at a time, into the simmering water (just be sure they have enough room to bob around). Allow the bagels to poach for two minutes and then gently flip the bagels and allow them to poach for an additional two minutes on the other side. Remove the bagels from the water and place them back on the greased parchment paper on the baking sheet. Repeat for all bagels. Once all the bagels have been poached, apply a light egg wash to the top of each bagel and then generously sprinkle each bagel with whatever toppings you like. Place the baking sheet into the hot oven. Drop the oven temperature to 450 degrees. Bake for 8 minutes. Rotate the baking sheet and bake for another 8-10 minutes, or until the bagels are a nice golden color. 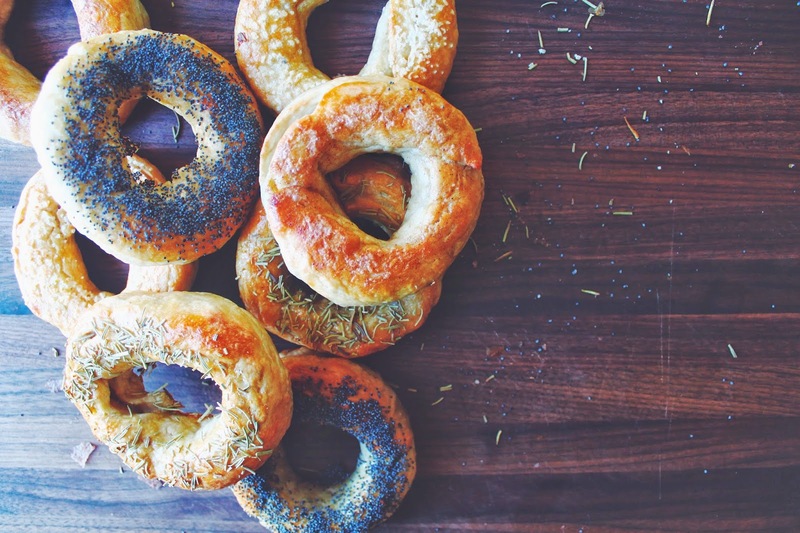 Remove the baking sheet from the oven and allow the bagels to cool for about 10 minutes before serving. These look AMAZING. I would love to make them at some point. 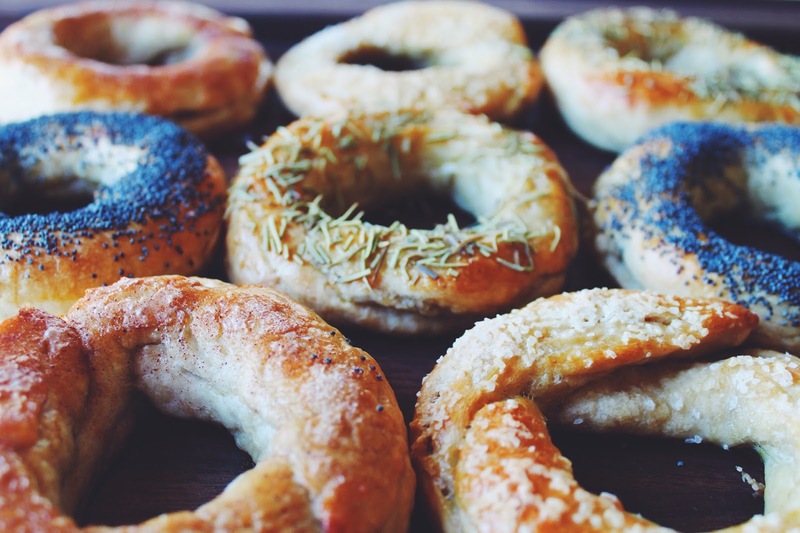 There is nothing better than a bagel on a weekend morning. Found your blog via Saveur's sites we love and felt instantly connected because I am also dating a chef! Look forward to reading more of your posts. Hi Sam! So glad you found my site! 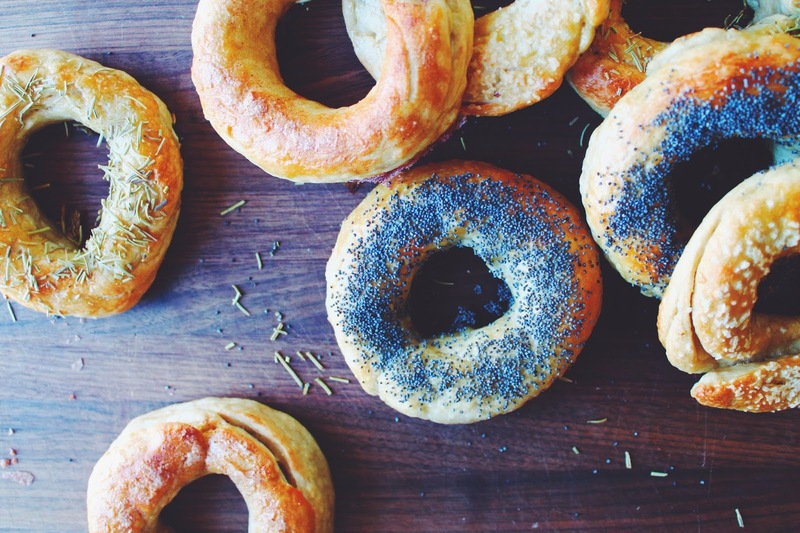 I have to say, these bagels are incredibly easy to make and taste pretty great, too! I popped a handful in the freezer, and they've kept well (just pop 'em in the toaster). I just checked out your blog -- great site! My husband and I are HUGE Chicago fans (the only problem: all I do is eat when I'm there :) Thanks again for stopping by! Haha. So true, Alice! You have no idea how long it took me to decide on toppings! I seriously stood in front of our spice cabinet for about half an hour going back and forth!